I’ve been participating in a regular life drawing class on Mondays, at Toronto’s Heliconian Club and have found the experience very valuable. We spend the mornings doing brief gesture drawings and longer poses up to 20 minutes.during the afternoon, the model holds one pose for two hours. Every year the sketch group mounts an exhibition of participants’ work. This year’s show runs from March 1 to April 6, 2011, at the Heliconian Hall, 35 Hazelton Ave., Toronto. There’ll be an opening reception on Saturday March 5 from 1 to 4, or call 416-922-3618 to drop by. 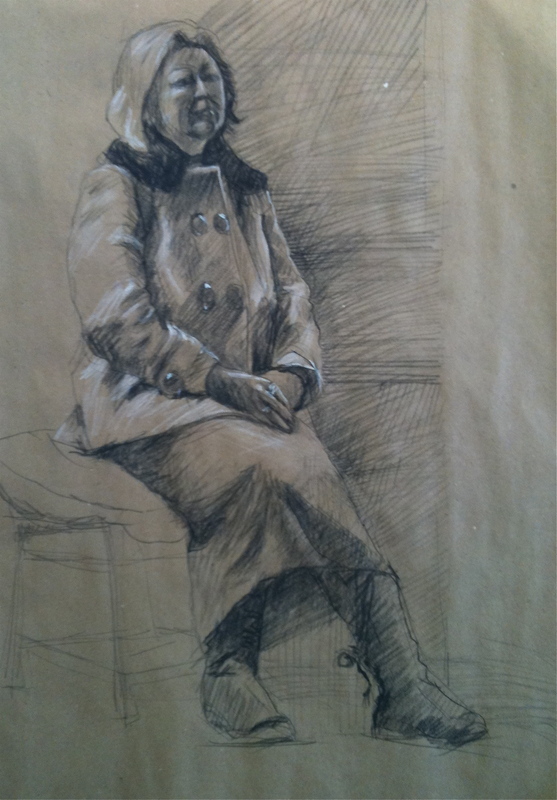 I’m exhibiting RED JACKET, FUR COLLAR, an 18 x 24″ drawing in black and white charcoal pencil on toned paper.